No ice cream maker? That looks almost too good to be true, even the chips are homemade–impressive :)! Wow, that looks very good. It uses ingredients that I usually have on hand so that makes it even better! I can’t wait to try it. That is simply breath-taking … looks delicious! I’m drooling over your ice cream. It looks so creamy and delicious. Thanks for sharing! sister, you are speaking my language. I am really enjoying all of your recipe ideas. I think I will make some of your peanut butter granola, but with soaked seeds/nuts. I may also try this ice cream eventually. Thanks! That is some nice looking ice cream. I could go for a scoop right about now! I love your blog! We also do not use gluten, dairy or sugar! I’d like to link to you, if that’s okay, and invite you to join this February’s, Go Ahead Honey, if you like, which I am hosting. This looks so amazing! So creamy! Mmm! that looks so creamy! I’ll bet you don’t miss real sugar or chocolate! I’m going to have to try making some ice cream soon! mutritiousnuffins – I don’t work with real sugar, but I’m guessing it would be similar! The powdered form would yield a less icy texture. Thanks for stopping by! Sophie – Your comments are always so sweet! Chris – Hope you try it and enjoy! Hayley – Thank you for stoppping by! Simplenaturalnourishing – We share very similar food philosophies. 🙂 Hope you like the granola, too! Maria – It is as tasty as it looks! Kelly – Thank you for the invite–will be taking you up on that! Cakebrain – No way I miss real sugar! With a little ingenuity you can totally replicate anything sugary and have it taste just as good or better. 🙂 Thanks for stopping by and good luck lowcarbing! I made this yesterday and it was very good! I skipped the nuts and chips and it was creamy and delicious. I served it to company tonight and it got rave reviews. I would like to try it with an ice cream maker next time. Thanks for a great recipe. 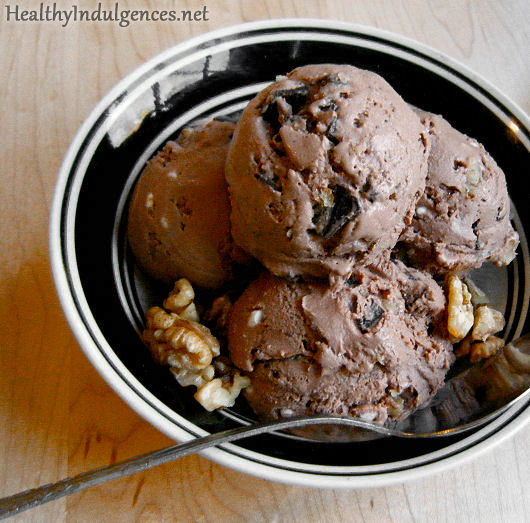 I made this ice cream yesterday with a couple of tweaks and the flavor of this ice cream is unbelievable! For some reason, although my ice cream was scoopable, it had an icy texture to it. The only major subsitution I made was tequila for rum (that being the only liquor I had on hand!) I also added cinnamon to the ice cream, figuring the tequila added a Mexican flair so I’d go for a Mexican chocolate theme. Anyway, once I figure out wat caused the icyness I plan to experiment a lot with this recipe! It is genious! Thanks for sharing all of your recipes and beautiful pictures! Lauren, you are a genious! I am dairy free due to allergies. Told my daughter that when I am too old and too grey to make sure she treats me with scoops of ice cream.Good news, I won’t have to wait that long. Do you have the calorie count? You are now posted on my facebook, and I’ve already got a hit! Jillian – I echo your coconut milk love! Elana – Thank you, and thanks for stopping by! Julie – Thanks so much for trying the recipe and reporting back! Did you use Thai Kitchen brand coconut milk, or another brand? Did you use the coconut oil? Glad the tequila sub worked out! Anon – Good to meet another like-minded eater! Hope the ice cream worked out well for you. Babs – Thanks SO much for sharing the blog on your facebook. 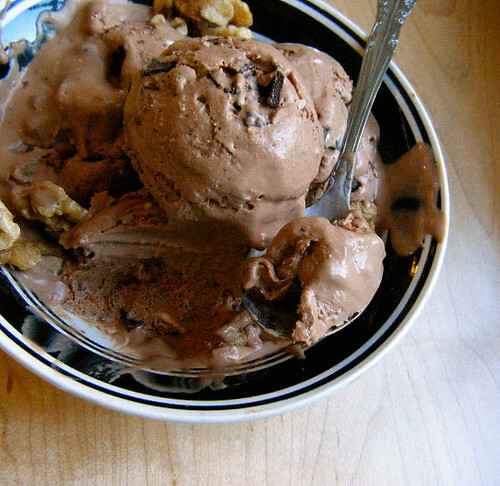 Glad you now can have a dairy-free ice cream fix! I do not have a calorie count, but I do use calorieking.com to calculate carbs. It works similar for calorie counts! I made the plain version of this last night. 🙂 The only change was I used triple sec instead of rum. Tried to make it in the ice cream maker, but I didn’t freeze it for long enough so I just had to pop the whole shebang into the freezer. Anyway, it didn’t end up scoopable, but it ended up insanely delicious anyway! This one is definitely a keeper. Thanks for the great recipe! Lauren, this looks great! 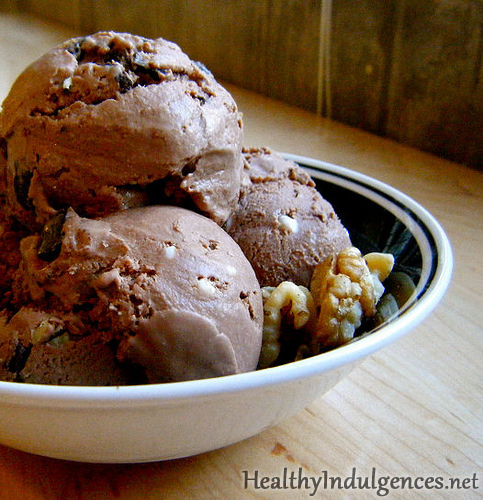 I have been meaning to try making low carb ice cream, but I never get around to it. Maybe this’ll be the kick in the dairy-ere that I needed. Thanks for the comment on my blog, and I wanted to let you know that I liked your site so much that I added it to my links. WOW!! Just stumbled upon this… It’s killing me it looks so good. Here I am at work drooling – wishing I was at home making this. Thank you for the recipe – it was delish and decadent tasting and I *love* the fact that I didn’t need an ice cream maker to make it. Thank you! i only have 100% unsweetened chocolate. should i just add a little more sweetener to make the chips? will it work? thanks lauren, you help us so much! thanks for share your recipe, i like it. Wow this looks delicious! Is it possible to just use stevia and not any sugar alcohols? can u use splenda in place of the other sweteners? Odd question I know but..Does cocconut milk taste like coccnut? I really am not a fan of the flakes. How big is one serving? I made this recipe following every single step, except for the nuts. When I got it out of the freezer in the morning it had crystallized. I used erythritol so I'm not sure what went wrong. It's almost like there are little bits of raw sugar all through the ice cream. So strange! Can anyone explain what happened? I made the ice cream last night. The flavor is unbelievably good! However, the ice cream's texture is gritty, like it has sand in it. What did I do wrong? I want to try it again but want smoooooth ice cream. Help!